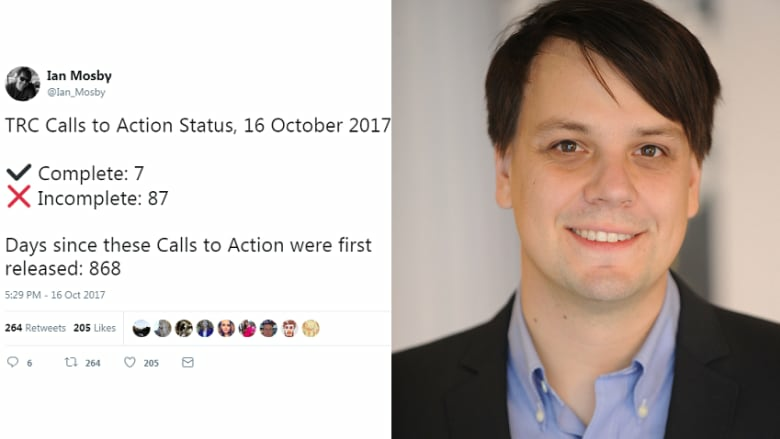 Ian Mosby didn't plan on keeping track of the completed calls to action on Twitter. It only occurred to him after he realized no one else was. In 2016, when he began tweeting his research, only five calls to action had been completed. Unless you work in news, government, or own a copy of the Truth and Reconciliation report, you probably haven't paid much attention to the TRC's calls to action. That's why Ian Mosby is keeping a close eye on reconciliation. Mosby is a self-described "settler" and historian. In 2013, he published an article which exposed details of government-led nutritional experiments on Indigenous children in residential schools. What he uncovered through that research ignited his passion for truth and reconciliation. "Since that was published, I've had the opportunity and privilege to speak to survivors [from] around the country who were a part of these experiments," said Mosby. "It really hit home to me, how important Canada's responsibility is to meet these 94 calls to action." Mosby explained he didn't plan on keeping track of the progess on the calls to action on his Twitter page. It only occurred to him after he realized no one else was. Since Mosby started tweeting the calls to action in 2016, the National Centre for Truth and Reconciliation has started monitoring the calls to action on their webite. Mosby said that when he first looked at the status of the calls to action in 2016, five had been completed. When he checked in again this week, seven had been completed. "One thing that the calls to action that have been completed have in common, is that they are very simple to complete, or they are calls for things that were already happening to continue." What Mosby finds most surprising, is that there isn't readily available information on any concrete plans to implement the remaining calls to action. Despite that, Mosby remains optimistic all the calls to action will eventually be implemented. "I think it's possible," he said. "Some of [the calls] can be implemented immediately, some of them will take years. But, Canadians need to know it's actually being done." Ian Mosby is a historian in Toronto. He has been tweeting the progress of the TRC's 94 Calls to Action on Twitter. FULL EPISODE: How are you putting reconciliation into action?